I love the check in feature used it a couple of time’s now and makes things super easy! Great way to skip the line. I love the idea of a haircut reminder, as I’d like to know how far I’m going after three weeks without getting a haircut. Unfortunately, the feature doesn’t work. Instead when entering the reminder an error message appears stating “Oops! Request failed: unauthorized (401)”. Retry results in the same error message. Checked in with half hour wait time, just right to make the drive. Wait turned from 34 to 0 after 10 minutes. Arrived at the salon and was third on the list. In my chair, I watched time switch to 1 minute (stayed at one for six minutes), then to 5, back to 1, then 0. Five minutes later, I got a chair. I find the Great Clips app easy to use. I like being able to see how many people are getting haircuts and the length of the wait time. One of the best innovations to hit the affordable Salon industry! Genius. Well done. Great for my 11 year old! Love online check in! Absolutely recommend. Inexpensive prices and very easy check in. I absolutely love this app! It’s so convenient to be able to check in before you get there, and then just walk in and get seated right away! Comes in handy when you have 2 little ones! Laura is simply the best. She cuts my sons hair perfectly each and every time we have ever been there. We enjoy using this app to reserve appointments. No Applepay even though you say you do! Probably one of the best apps out there. This thing saves me a ton of time with no bs. This app is amazing for saving time. However, it would be helpful if you could request a specific stylist. We have grown attached to one particular stylist and wish that we could request her through the app for a more accurate wait time. The app will say 10 min wait, but with all the specific requests for her, we had waited up to an hour in the past. It was a much better app when you could Check in when the stores opened. Now you have to wait 5 minutes after it opens to check in. Stupid. 5 stars to 2. The “Add to my Great Clips” function has NEVER worked in the app. I love the check in app!! So simple. It’s great to see the stores around me and how long a wait time each has. So good! Used to be able to check in with this app and drive to the salon around the corner and was in and out with no problems. For some reason the app makes you wait five minutes after the salon opens to check in now. Huh? For what? So the people who walk in have priority? Well then I guess there is no point of having the app and online checkin right? Guess not. Guess there’s no reason to come here anymore either. I’m going to this location in Torrance, CA for last 17 years along with two boys and my brother. Excellent staff. Always a great hair cut except few times. Just like I had the worst hair cut experience last time on August 28,2018. My hair stylist was named Angelica. She took less than two minutes (literally)to cut my hair. I was surprised that I’m done. When I said wow that was a quick one. She said “You don’t have a lot of hair left.” When I checked my hair cut at home. It was BAD. She didn’t clean hair around the ears and neck. Hair cut was uneven. Even my wife asked me what happened to your hair☹️. I have to remember now not to have Angelica cut my or my kids hair. It easy to use I loved it!! Wait time estimates are way off! Everything is simple and it’s wayyy easier than going online on the safari and checking in. I’m so glad I got the app. I like this app, but somehow I cannot send haircut reminders. Could you please fix it? I’ve always gotten great haircuts here and all of the ladies are very nice! I will continue to come here for my haircuts. Easy to use! Friendly staff! Megan not only did a nice job cutting my hair, but also gave some great grooming tips. This place is a deal! My Hair was effectively cut with a short wait. Estimated wait times never correct. I think it’s a total waste and very misleading. I love Great Clips especially their check in online feature! 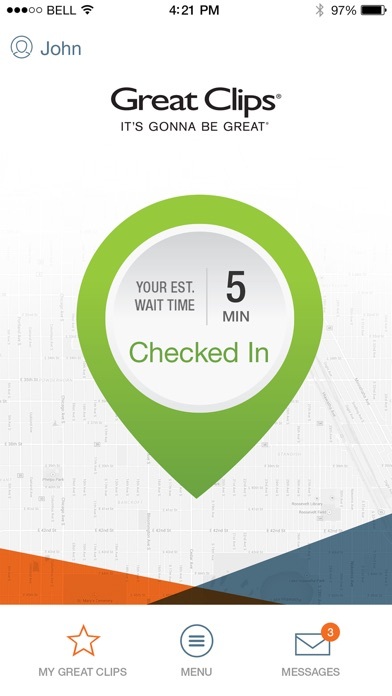 Their check in online feature allows you to eliminate wait time when you arrive at great clips. I get the same errors over and over again when I open the app and choose a location. I get a different error when I try to create a profile. The app can sign me in as a guest just fine but not as an official user. Always helps me find the shortest wait time. Add history and display stylist name. When you book online allow customer to select stylist!! Avoid the long lines at the stores and get the app check in online. Totally worth it. This is my 3rd visit in a month, service and the Quality of the haircuts I’ve received are excellent, I leave with a great cut, look and attitude and more importantly a piece of mind....that I have clean even cut..
Love the app! Just a foot note...sometimes I check in with my friends/family and they have different numbers...when we check in, we have to have some one put at the bottom of the list, (the comp asks for one number and assumes we have the same accounts) however the stylists do a wonderful job of honoring my friend’s spot, the only bad part is that other customers don’t know that my friends checked In with me. Is there a way you guys can revamp either the app or the computer system to prompt the stylist for another number so that this issue can be less of a hassle? Thank you for your time! Very professional, courteous employees- never disappointed. For a guy Im very critical of my hair. I trust these locks to great clips! In the past I would have given this app a four star rating, the only reason it was a four instead of a five is because I had to wait until the store opened before I could checkin. If I could have checked in five minutes before the store opened it would have been a five star rating. However, they have made a recent change that you cannot check in until the store has been open for five minutes. This makes this app useless to me 90% of the time. If this app changes back or better yet to 5 minutes before I would change my rating. I am using this app for Android since last 5 Year’s and no issue for Android....today I tried from iPhone and it lost my checkin when I walked to store... lost my 1 hr wait.... how will you pay me back lost 1 hr. Always kind, great haircuts. Perfect. This app is the only way to go. Check in at home, they are waiting for you when you get there. Highly recommend. Love the app for checking in, gets me right in for the cut and I’m on my way. This option is not working. Please check the error’s that users are receiving when trying to turn on this functionality. One of the reasons I continue to use Great Clips is the app. I got the app so I could check-in before I get to the shop. I live down the road about 8 minutes and was unable to pre check until I walked in the door. By that time there were 5 people a head of me. Not worth your time. My family and I have been going to Great Clips for the last 7 years. When we found Nickie we knew we would be clients for good. My son refuses to let anyone else touch his head (and so do I) Nickie is AMAZING at what she does. She’s a total professional and able to give you the exact cut you are asking for. She even did my daughters hair for prom. I sent a close friend to her who has very curly finicky hair and she loved her so much she won’t go anywhere else either. Highly recommended! The app works as it is supposed to, but it is highly optimistic when it estimates the wait time. As a general rule: double whatever it tells you. Why do I get coupons by mail and not on the app? I throw away my mail. Love going here for my sons appointments!! A lot of the women are there consistently for years and years which I like. They are fast, profession and know what they are doing!! I have been using GC for a few years now (Port Orchard and Gig Harbor), I've never gotten an unsatisfactory cut. If I ask for a little more work to address something, they do it without hesitation or complaining. Their system is good, I'll just keep going to them. Great app that does what it’s supposed to do. Very happy with ease of use. I really like being able to see what the estimated wait time is and the ability to get our names on a list. However, I’ve found that every time I use this app in the last 6-8 months the My Great Clips location feature doesn’t work - I have to zoom in on the map and find the location each time which is frustrating - we only go to one location since the other closed. I wish you could pick your stylist you want. On the super cuts app, it tells you which stylist are there and you can select the stylist you want or can pick first available. This is a great feature. However not the n this app. I have a guy at great clips that did a great job and if he is there I want him not just whoever. So this would be a great feature to add. I may end up doing Supercuts just because of this feature. If you have a bad stylist you definitely don’t want them again. App works as it should. No complaints. Only thing I wish it would do is be able to see the history of your cuts including stylist and their notes. I’ve gotten some great cuts and can never remember who cut my hair. We used this app successfully until summer 2018, up to which point it was awesome for getting in and not having to wait. I couldn’t say enough good about it, even using it as the standard of how an app of this type should function. Lately, however, when we check in it will say some low number of minutes when we check in, but when we arrive somehow an hour has been magically been added to our wait time. To me, that makes the app pretty much worthless. Not sure what happened, but it doesn’t work so well anymore, which is sad. Love the online check in. I can continue getting my stuff done and arrive when it’s my turn rather than sit and wait around in the lobby. I wish the app would tell you who is working and let you pick a stylist. Nice to see the wait time. If this app would include coupons like some other apps it would be fantastic. My address doesn’t receive paper coupons in the mail and therefore I can’t take advantage of offers that others do; for example, back to school specials. Please consider this important feature. Love the idea, but so slow. I love the idea of this app, it is so convenient. I’m glad it can send me reminders but in general it is so slow. If it were as fast as it should be, no doubt it’d be a 5 Star review. Best place to get a haircut! What’s the point of checking in when you have a 16min when checking in, but when you arrive you have over a 20min wait after an 8min drive. I should have only had to wait 8 min. It’s easy to use and makes being lazy so much more convenient! I love it! How do I change my home city? I’m in Oxford OHIO now. I can’t sign in up here...it is locked in to when I was in Florida. Locations are difficult to determine. Easy to use and very effective. I enjoy being able to go to the head of the line whenever I get to the store! Very happy after the first visit. Not so much the last three visits. I’m done. I talked with one of the assistant managers, and he wanted me to come in and let him look at my hair. My complaint was with the last two visits when she styled it only. I told him I didn’t need a style now, it was too late, and I wanted my money back. That didn’t happen. This is they take care of their customers. VERY DISPLEASED AND DISAPPOINTED! I have tried multiple times to sign up using this app and it continues to fail on open. Super easy to check in. Only complaint is that the map doesn’t zoom into my location correctly! Checkin was a breeze and quick response time. Why emphasize online check in but not allow online check in until 5 minutes after the store opens. I got to the salon before it opens and there is a line of 5 people. I thought the point of online check in was to avoid lines! Nice and easy to use love it! Did not work the first time I used it. App said no wait. “Checked in” on the app and they had no record of it when I showed up. Actual wait time at the establishment I booked at, about a half hour. I never have to wait in the waiting room! The app makes it so much more convenient to get in and out. My kids and I have busy lifestyles so this is a huge benefit. I checked in online. I was the second person in the online check in. The woman said she’d be right with me. The first person from online check in came 10 min later right as soon as she finished. She proceeed to then check him in then me and I had to wait. It was bs never got a reason but after my sub gets his hair it there no more great clips for us. The only reason I didn’t give it 5 stars is because all other haircut apps I’ve have (just confirmed SportClips before posting this review) also allows you to select between the stylists if you have a preference. This allows you to know if your favorite stylist(s) are working without having to call or stop by, which is incredibly convenient for people like me that work 60+ hours per week. In addition to convenience, this would also allow more cuts total for your company by lowering the wait-time during peek hours. When a stylist sees they’re being requested by an online check-in, they could have the option to pass the next to walk-in along to the next available stylist in the rotation - allowing the entire process to be streamlined. Less average wait-times and more cuts = happier online check-in’s, happier walk-in’s, happier stylists, happier company. It’s a little frustrating when I'm waiting an extra 20 minutes minimum just due to the rotation, while 2 or 3 more stylists are without clients just because that’s how to rotation fell. I get a haircut on average of about every 10 days so I spend a lot of extra time sitting around just from this issue that seems like it could be an easy fix. I assume your employees have their schedules online at this point so it would seems fairly easy to have them integrated; especially considering I know it’s an active feature with other larger related business. Just for clarification, this isn’t a complaint nearly as much as a suggestion as requested in the app details. I have much more positive things to say about GC than negative! It works to check in, but I’d really like to know who is cutting hair the day I come. Another hair cutter’s app has who is working and I can request that person. I’ve had my hair cut from almost everyone at my local place and I have my favorites. It would be nice to know if I should go this day or wait until the next. It meets the need. Not any more complicated than it needs to be. Does online check-in really help? I’m confused over this app. I check-in and it gives me an estimated time that we should be there. We get there and complete the check-in process and yet pop up on the screen in last place. I guess I don’t understand what benefit the customer gets when they take the time to check-in online vs walking in off the street. Doesn’t appear to be any benefit. App works “great” every time. This app works great and is a true time saver. I can check in and know exactly when I should arrive to be the next in line. I rarely need more than 15 minutes to arrive, get my haircut and be on my way! Great Clips app is awesome! This app is super helpful. It allows you to know how busy your store is. It also lets you hold your spot till you get to the shop. Fantastic idea! Edith in Lake Wales freaking rocks! They don’t take reservations so, this is the next best thing if you value your time. Quick and easy with the online check in. Alex is the best!! Love to have my kids hair cut there!! 3 clicks and I’m reserved for a cut! This app really saves time. I don’t waste time waiting around. Easy to use app. Cuts my wait time by a large degree! They are super fast and friendly! Great staff! Always friendly and willing to get us in right away. Good prices with a good service. The App is useful, since you can check in online. Use this app to get on the list. I always use this location cause my cut is usually done quickly and how I want it. I drive from Pahrump Nevada just to use this location on sunset and Whitney ranch. The Great Clips in Mundelein off of Midlothian and Hawley is one of the best Great Clips I have ever gone too. Very proactive, quick, efficient, and is very consistent. I rate this location five stars. Best ever in and out service I have ever seen. All stylists are the greatest in personality and hospitality! Tiffany is my stylist and is an absolute gem! Love the App! But improvements could help. Love this App. It would be nice however to be able to schedule a hair cut at a particular time such as 2 hours from now. This makes everything so fast. I have had my hair trimmed several times here. They always listen to what I want and I leave feeling better every time. Great customer service, amazing stylists, family friendly atmosphere, very welcoming!!! Easy to use and never fails. Made reservation and got in fast! Very happy with GC’s and their app. Super easy and always a consistent cut on my kids. No matter where I am in the city, I use this app to find out where the shortest wait time is and the closest Great Clips to me. It is such a time saver! Great app easy to utilize. Great app easy to navigate. Can you please show in the app the hair stylists working that day and their hours? Also, allow us to choose a stylist when making an appt. Supercuts does this and it’s very helpful because I don’t have to call the salon and interrupt the staff. Kiki did a great job cutting my hair. She and the staff were friendly and professional. Great app to check in online and look at wait times also. Quick and excellent. Haircuts are professional and quickly performed. This app saves me a lot of time and frustration! This app really works great for getting in line early, I almost never wait in line anymore and when I do it’s usually only a few minutes. I hate having apps for every little thing but this app is actually cool. I can see which great clips in my area having the shortest wait times and just go. Very convenient. Recommend to anyone that wants a great cut and people always welcome you with a smile and a hello ! Online check in is great! Great feature, easy to use and pick a location. Your ap works great for locating and reserving a spot. Good job. The app works great and it makes my errand day very efficient. Easy way to get your family in line to get hair cuts. I’ve been coming to this shop since 2002. They always take care of me and my hair! App works just as advertised and love it. However, lately clicking on directions just doesn’t work right. It plots the locations but won’t actually make my map apps direct me there. When I manually input the address it works. Please fix. Definitely saves me time waiting for a haircut. It gets busy at the place I go. This app is very helpful. Especially when I need to cut in line and get my hair cut quicker. Love this app, check in is easy! The C.P. Great Clips is Awesome. There always fast friendly. These ladies make every visit a great one. Always making sure everything is great and as I want it. Check in as easy and when you get there you can sit and get a haircut instead of waiting in the lobby! Very fast and friendly and very professional never have to remind them what I need done due to them having it logged from the last visit. Great to be able to easily check in from phone! Enjoy the app and the ability to get a spot in line before arriving. I love the convenience of checking in on line to avoid the long waits! Hair in seat where I was told to sit. When I was looking for a place to put my bag, I was directed to the workstation counter that had on it from one end to the other. Online check in is a game changer. Love it. It’s so nice to be able to check in before you go. It’s eliminates having to sit around and wait to get your hair cut. The Hairstylist at this location do a fantastic job! Been going there for 10 years and I don’t plan on changing that! Excellent team! Many talented stylist at both downtown locations! Porter is the man! Use it every time we get haircuts. Saves time. Always great service!! Nice people make for a awesome experience. Great salon and great app. Makes it easy to check in. 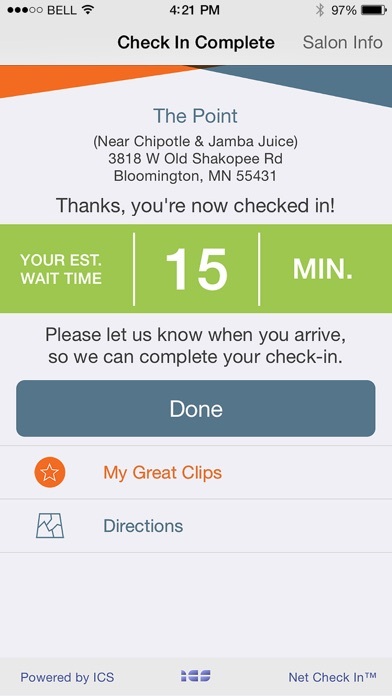 This easy to use app presents great clips locations in your area and allows you to check in virtually so you can skip the wait and be served quickly at the shop. Best thing since sliced bread!! Check in on the road and save your place in line. Best idea EVER!! Fast, friendly and always professional. Always get good service from friendly stylists. Thuy and Azeb are best!!! Great app to save your place in line to avoid wasting an afternoon in the waiting area. The only thing I wish is for the ability to select a preferred stylist, or even see if they are working that day. If they aren't there, I won't go. Works great, allows me to check in, walk in and sit down for a haircut. No hassles and almost no waiting. I’ve been going to Great Clips for years so have many of my family members and friends. I’ve even got some coworkers going now. They have great hair technicians, great service, several locations, and using their App has been so helpful so I can check in and plan my day accordingly. All in all Great Clips is GREAT!! No problem using it. Never failed me before. Shows salons wait time which I like. Easy to use and it is nice to get updated wait times. Use the app and show up in the suggested time frame and your at the front of the line... no more sitting and waiting all day! I like checking in. It cuts down on the wait. The ladies are always very friendly and give wonderful haircuts! Thanks! Allison did a fantastic job on my hair great employee!!!!! 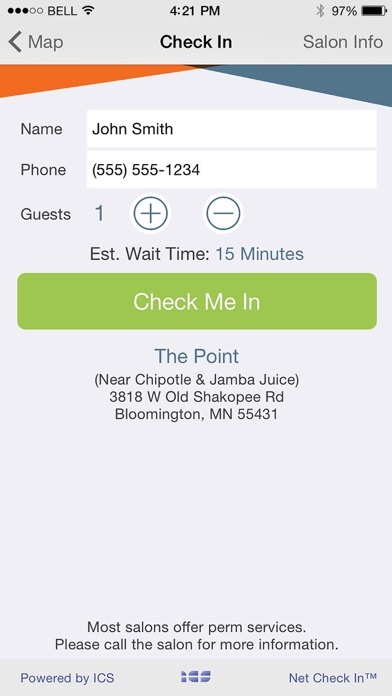 The app provides real-time wait times and gives us a good way to beat the crowds. I love the innovative app that is a timesaver, improves efficiency, and customer satisfaction. I love the way these ladies cut hair. I always go to Jennifer and my boys also get great clips from other stylists. Nice to see wait times and the ability to check in so you aren’t waiting around. Would be 5 stars if you could select or specify the stylist you wish to use. I love this app. It is so easy to use. I can see the wait time and decide the location. I used it for my family hair cut. Awesome app. Cuts my wait time at the shop. I use it all the time. Nothing fancy, but works perfectly for check-in. I’ve been having Brandi cut my hair at the Creekview Salon for over a year now and have never had a bad cut. Her attention to detail and professionalism will keep me coming back. Keep up the good work Brandi! This is a great app, but doesn’t really correspond to the wait time at the shop. When the app says 10 min wait, and you get to the shop and it’s a 45 min wait, that’s annoying. Extremely professional! Best haircut imaginable! Check in feature does not work in the app or on your mobile website. Awful. This should be so simple! How this got so many good reviews is amazing to me. I'll be uninstalling and going somewhere else as I have now spent 15 minutes trying to check in. Terrible. Good app that helps you to register up to one hour before you arrive. Best App ever i don't have to wait just check in and walk in were your time is up! She has been cutting my hair since before I had kids and now cuts my kids hair. She does a great job and my kids love her. Thanks Nancy! Very convenient and enjoy it. Wish you could make reservations in advance, even if just same day. Thanks! Makes getting a hair cut so much easier! No more waiting around. Just put your name on the list and show up when it’s time. I love having this! What a time saver! Very useful App! Never been disappointed with the haircuts, either! Works great still don’t understand why more people don’t use it. Awesome Staff!!!! I’ve been Great Clips customer for over a decade. The hairstylist that did my hair this evening did an awesome job. She had a lot of experience and was very kind. I would highly recommend Great-clips. I’ve been going there for years and haven’t had a bad cut yet. Thanks!! Awesome crew. Always positive atmosphere. Everyone at great clips always do a great job. Keep up the great work. The online check in meant no wait. I neglected to get my stylist name but she was amazing! She gave me a great cut and took a few minutes to find out my styling routine. She showed me a way to style my hair with a new product (which I purchased) She was the highlight of my day! This is a fantastic app. Skip the line. They “clip you”, but in a good way. Easy to use and a huge time saver!! Keeps me coming back. Great clips App is Great! Love mobile check in and store info! I love that I can check in and save time waiting in line. I love that I know about how long to expect and that I can see all the locations and their wait times in my surrounding area. unable to update my profile nor make a location in my favorite list since last app upgrade ! Map is cluttered. it never saves my favorite location to my favorite list ! I reported this issue before only to get a message to call you to help me ! well u can help me by fixing the favorites location issue ! Every time I click on favorites i get the sad face display unable to load my list. try again later. I have one location marked as a favorite but i get the sad face !! Great app. Allows me to check in and to know how long I would wait. Sometimes I will do some other errands and delay actually checking in until the wait is shorter. Always convenient to get in! We absolutely love Jasmine at the Southdale location in Des Moines IA. She is the only person my 16 year old son will let cut his hair. Oddly one of my favorite apps! Who knew a haircut booking app could be great. However, it really is. I can book an appointment in under 30 seconds. I’ve used it for years and though it may be a mono-tasker... it knows exactly how to do it fast and efficiently. Excellent! Nice to check in online- keeps you from waiting and you know how long your estimated time!!! Love being able to check in online and avoid the long wait at my local Great Clips that is always busy. Right now grabbing lunch while the 27 minute wait passes. Just works perfectly. Been going to Great Clips in Reems and Waddell for years. Everyone knows my name when I go there and is very nice. Love being able to check in online too. Excellent and easy to use for quick checkin. Always know how long my wait will be. This app is great! I usually go get my hair cut during my lunch hour and it is very nice to check in online before I leave my office and not have to wait once I get to the salon! Would be nice to select individual names. Very convenient check in. Love it. So convenient for checking in and live the info on the wait times. Makes it very simple to find the perfect location near me. Love there is no wait! Great clips I always go to is on Woodcreek usually they have a weight but it’s pretty amazing when I get to use the app! The manager there is pretty amazing with my kids! Fast, professional service for such busy location. Quite friendly, also. Great app = great haircut; every time! Greatest Haircuts Ever!!! Nice people and Great Deals all the time. THANKS GREAT CLIPS!!!! So helpful with 3 kids! I don’t sit around wasting time! Love it!!! Consistently refused to find my location, let me log in, and often returns the error “An error occurred please try again later.” Uninstalling and reinstalling does not fix issue. Location setting are on. Very frustrating. Very nice people in this location. 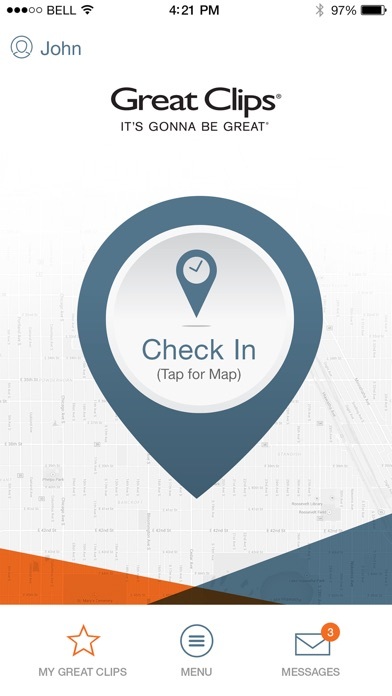 Checking in has never been easier! Best place to get a hair cut and the ladies there are the best. This app is great to avoid long waiting times and unnecessary trips! Love the online check in. Great hair cuts! Great app. Was able to walk in and someone was wait for me. In and out. This app works well for giving me the expected wait time. I checked in and arrived at the time it said. They just skipped us and went to the people that were waiting before us. I probably could have forced the issue, but it’s just a haircut. They should mention that your place in line is at the discretion of the staff. Simple but limited functionality. The app is intuitive, user friendly, but limited to only the one user. This is impractical for mother’s and care givers because they can not make appointments for children or other family members such as grandparents. The quick sign up online is the only way to do this and defeats any need for the app. Half the time I head over when it says 5 min wait time left and I’m no longer on the list by the time I get there... If you are going to have a timeout at least let us know when we are in danger of getting bumped off the list instead of wasting our time. Great hair cut, love the app! Always get a good haircut, senior and military discount makes it very affordable, just can’t beat this place. Convenient but wait times are inaccurate. Great idea, but for some reason it doesn’t appear to talk to the store very well and the wait times are not accurate. Literally checked in while next door to the store and the app said the wait was “0 minutes.” We’re waiting. And apparently will be for awhile. Quick appointment setting through app. Literally 2 clicks. Not able to sign in. I’ve deleted the app and reinstalled but still get error -202. The app itself seems ok but there seems to be no support I can find to fix this issue so it’s really not any better than just calling ahead. Shantelle at Great Clips in Alvin! Shantelle in Alvin is wonderful... I love her... customer service... her styling technique are on point! Great cut for the money. The only good feature of this app, check in, has become useless. I loved this app. Told everyone about how great it was. Sadly it’s now useless. I checked in and was told it was a 20 minute wait. The wait got down to 2 minutes then shot back up to 17 minutes. When I arrived I was told at least 15 minutes. This makes the entire concept absolutely useless. Time to find a new place that doesn’t misuse my time. I like my hair in a short pixie cut. Today was a wonderful cut. I had Morgan do my cut. She was outstanding. I love that she blew out the cut hairs still in my hair along with the massage. That was so wonderful. Diana gave me a great cut and was super nice. The Great Clips App is well designed and very user friendly. It remembers all your required information so all you have to do is click the Check-in button to hold your place in line. Getting a haircut takes little time now. I know how long my wait is before I get there. The app is very convenient for check in, and it works well for that. However, other functions are simply broken. Any attempt to edit and save changes to the haircut reminder throws an error (401 not authorized). Attempting to send feedback through the app doesn’t work, either. Apparently there’s a maximum length for the feedback message, but there’s no way to know what it is, and the app doesn’t tell you your message is too long until it tries to send the feedback and fails. Whatever the limit is, it’s too short to provide the developers with any useful information. I kept trying to shorten my message, but couldn’t get it short enough to make the app happy. Works great and saves time. Would love to have the option to select a stylist. I don’t know if it’s possible to relate a stylists “clocking in” as making them available to select or if it’s something as simple as a open text comment box so a user can specify the stylist or anything else for check-in. Would also like the ability to see how many others have checked in before me that are waiting. There are times it shows a zero wait time but when I arrive there may be several others that checked in online and then arrived in person, resulting in a bit of a wait. Checking in is quick n easy. Great app and easy to use. Quick and good haircut. Always friendly ! I have only had one bad experience at any Great Clips I go to. That one experience the person handling it did everything they could to make sure I had my opportunity to discuss my feelings about it. This turned a bad experience into me knowing they admit when they mess up and do what they can to take care of me the client. I appreciate that and continue to get my haircut there because of all the other great serve I still continue to get each time I stop in for a haircut. Thank you Great Clips for taking care of me in good times and in bad times. Online reservations and a great haircut for a good price. Tip well! Yes you can check in online but the information you get about wait times is often false. Once I checked in using the app which said I had a 10 minute estimated wait time and when I arrived at Great Clips, (during their normal posted and advertised business hours) the doors were locked at a hand written sign was on the door reading that they were closed for a staff meeting. Another time I checked in and according to the app, it was a 30 minute wait time and when I got there the stylist informed me that is went up to 70 minutes because someone just clocked out for lunch. Very user friendly. Love the fact they send haircut reminders. Skip the line! Easy peazy! Select location, check in, show up on time, job done. Simple, easy to use, wonderful app. When you check in using the app it doesn’t tell you how long that’s valid for or give you any indication of when that check-in expires. For example - I checked the app when I left my house and I was checked in. Drove 5 minutes to the store and my checkin had expired with 16 people on the list. Needless to say I walked right back out the door. A company this size should have a better app. Great app. I have been using this app for a couple of years and find it very helpful in reducing and/or eliminating wait times. Really easy to use. No issues any time I use the app. Takes literally 30 seconds to check in. I have used this for several years and I love it. I have never been able to use the reminder function. It gives me a 401 error. Perhaps one day it will work, but for now, it’s an essential app for me. Was able to monitor wait time and reserve a time that worked for my schedule. Very friendly app and easy to use. Great concept but the timing neds to be adjusted. I checked in with 23 minutes to go. 30 minutes later there was still 23 minutes to go when I arrived at the hair salon. Makes it so much easier to check in and. Ask ally walk in as our names are called. No more long waits sitting for our turn. Definitely easier for families with disabilities who have trouble waiting around. Use the app every time. Very frustrating to try to use and find out it’s not working. Happens MOST OF the time!! My hair was cut by my usual hair dresser Amy. She has a great personality and she’s fantastic with customers. She always asks before she does anything different with your hair. I personally will not go to anyone else, I know with Amy I’m going to get exactly what I want and a great conversation. The best stylist in the city! The service and smiles at this location are second to none. The girls here cut your hair the way you want it. It’s that simple. On another note I have a family of five so it doesn’t break the bank. Thanks again! Depends who you get. Some are better then others. It much more to say. It does what it says it does. It would be nice to have the option to select a specific stylist. Some people have their favorites. Great cuts, great staff members, easy in easy out. I like being able to check in, but I would also like to be able to choose a specific person to cut my hair. It would be great if I could see who was working and pick the person I want to wait for. Also, can we get a visit history of some sort. Beware -Stores may not honor the app! I checked in through the app at the Nassau blvd store in Princeton NJ today. The app said there was a 62 min wait. When I show up after the wait time indicated by the app, the store had already cancelled my place in the queue!! They asked me to be at the store within 30 minutes irrespective of the time shown on the app! Not sure if this is just one store, or whether I can trust the app anymore. This app is very easy to use and is very convenient!! I check in my boys and tell them when to arrive! Easy as that!! I’m done with great clips. Rather pay double and get a decent haircut then have them butcher it every time and end up paying double anyway to have someone fix it. So easy to check in! This makes getting haircuts a breeze! I love the app and the ladies in Paso Robles location are great! Unreliable - What’s the point? This app is very unreliable. I can’t count the number of times I have used this app and completed a check in, started driving to the great clips I selected, ensuring I have enough time to get there just before my check in time, and it kicks me back a half hour. I am unsure if they do not value people’s time, but be aware your check in time is inaccurate. What’s the point of checking in if it won’t lock you into that time? Every time I have ever gone into haircut reminder I get the same error, Oops! Request failed: unauthorized (401). I’ve never been able to get this function to work. Any chance of it ever working? Love the website and all the stylists at all the locations I’ve been to have been great. App did not check my appointment in and the people at the salon were rude about it not working! 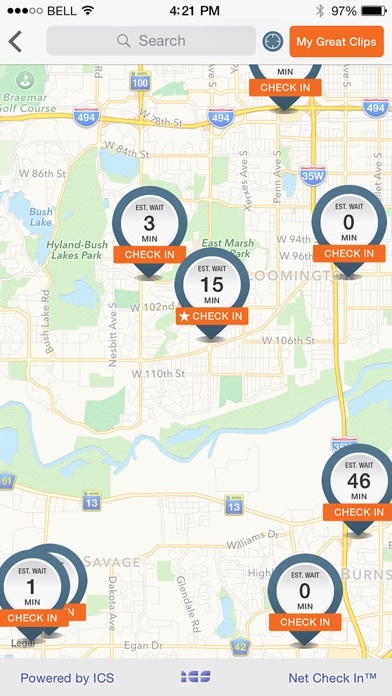 This app is great when we are trying to squeeze a haircut into our hectic family schedule to know what wait times look like at the locations nearby, and the check in online feature is so convenient! Checked in online, walked it 5 seconds (literally) after 3 others who did not but they were served before I was. Not sure if im misunderstanding what checking in means, but i think this location got it wrong. Quick and friendly service. Good job! Thank-you. In my view a haircut is a commodity. Paying a premium price for what seems to me to be a standard service is not justifiable. Justin Bieber may pay a fortune to cut long hair short. My hair has been short for decades. I am only paying to keep it that way. Great Clips makes it happen with consistent quality. When I tap "My Salon" all I get is a "Loading…" page with a spinning wheel. Never opens. Hasn't worked in ages! Also, when I do my Salon's info by tapping on the on the pin on the map, it still says "Next to Fry's Marketplace," which hasn't been there in three years. I have Great Clips the same feedback months ago. Works for checking in, though, so for that I like the app. P.S. A lot of the reviews here are of the salons, not the app. if my guy/girl is working? Reminders has never worked. Displays an error when trying to create haircut reminder. Also, can’t seem to see my favorites today. App is not reliable. Great group. Love them. They do a great job! Wonderful location. All the stylists are great. Never had a bad cut. The app works great but it’s not a real check-in. People who go into the salon after you checked in on the app are placed ahead of you because they were “there first.” This you can’t rely even on the time estimate. So, the app looks great but in practice is a sham. Always great at Great Clips! Love the easiness of the app and they always do a great job. Awesome place to get your hair cut!!! Happy to have Hair, still! Awesome, easy to use, really a time saver! Run your errands! Eliminates waiting in the shop! Thank you! Don’t trust the wait time!!!! Ours was 21 min and we are going on 45 with no hope in sight. Couldn’t make it any easier! Makes checking in so convenient. I love this app. The staff does a fantastic job every time. They’re not letting you out until your satisfied! It would be better if you could see who was working at each location and checkin for who you want to see. That would put it over the top for me. Great App. Saves time. I think it would be better if you could also choice the stylist you want to cut your hair. Let’s see if we can get that on the app. I like that you can look up wait times and check in early. So convenient when you have kids and don’t want them to wait forever for a cut. I checked in online as I was not too far from the salon. I literally walked in just as another person was checking in. Myself, the person who checked in after I did, and one person in the chair. Two stylists working. I know I checked it at least 2 min before I walked in the door, and yet I was skipped over cause of the person who check in after I did. If you’re going to have a “Check In” app, might want to rename it since it not a real check in. So I’m dropping off a package at UPS next to great clips and see 2 employees sitting and talking with no customers. One of them has been cutting my hair for @ 20 years. I’m with my kid so I let him go first and wait for her to finish and do mine. As she gets done with him a guy walks in and she says she has to do him first because he checked in online. I say ok. While I waited 3 more walked in. When she’s done with him and swept up she calls another guy. I said I should be next and she said they all checked in online. So with my 5 year old going stir crazy I demanded her to let me pay for his cut and leave. New rules or not. I’ll never go back. I’ve tipped her $10 a cut since high school. She messed up. App apparently does not request to be able to send notifications, once redirected to iOS settings screen I can change settings for location, background app refresh and the use of cellular data, no notifications. As result one of the main features of the app is non-functional. Amateur hour? Twice recently they said it would be 20 minutes after app said they’d be ready when I get there. Need more employees. Switched to local barber . I love it! Seriously improves my overall experience because I Cal instantly see what the wait time is....in 2 clicks! Hats off the the technology department that develop and deployed it! Drove to the Salon with a 24 minute wait. When I got there I was third on the list with a 14 minute wait. At 0 minutes someone showed up and said they were a mobile check in too and two names popped above mine. The App then showed a 48 minute wait. I won’y use your app again because apparently a mobile check in doesn’t mean anything. I got jumped and don’t even know why! I only like hair cuts from Jenny. Sorry I have tried various other people and they just don’t get the cut right. Thick and layered hair. Jenny tells me it is an old style cut. Really it should not be that way. Jenny takes the time to make sure it lays right even after it’s dry. Which makes it SO MUCH easier for me to get my hair styled right. Nicole provides a great haircut every time. App is everything it needs to be. Good in theory, but time estimate is highly unreliable. It even adds time (30 min added today) after checking in, presumably for unplanned smoke breaks. Great clips, great value, great people, especially Dawn! I’ve been going to the Cedar Park location on 1431/183 for almost a year. I always see Sabrina, she’s always really friendly and does a great job. I highly recommend her to friends and family. Great Clip staff shouldn’t be asking customers for their name and phone number in public instead should share screen and let customer interact in silence. That would only be professional. Otherwise the app is phenomenal. The app needs to hold support for the great clips discount card. Stores also need to accept Apple Pay. Helps me plan my day!!! Super easy to use. Went to Great Clips this afternoon and met a wonderful young lady by the name of Jessica. I think I got one of the best haircuts I have ever had.Jessica is very knowledgeable and gave me the haircut that I have tried to get for the past few years. Thank you Jessica. the wait estimates are gimmicky, the wait times are no different than walking into a store, I checked in wait time was 14 min, I show up within 10 minutes. Then I am told i will have to wait 30min minimum, app is like the fake news, Very disappointed, bad company, bad app. I generally get the basic 3 on top and 2 on the side. Team always friendly, quick and do a great job. This app is great for seeing how long the wait is, and for checking in online. It has a ‘reminder’ feature but for whatever reason it does not notify me on the scheduled date. Instead, I get a message several days later telling me I missed the reminder. Other than that it seems to work well. We never we wait in line for haircuts anymore.